Flowering Date Early-midseason, all rebloom. 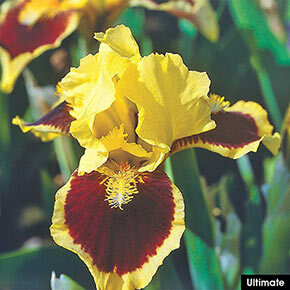 Miniature German iris make the ideal front border plant. 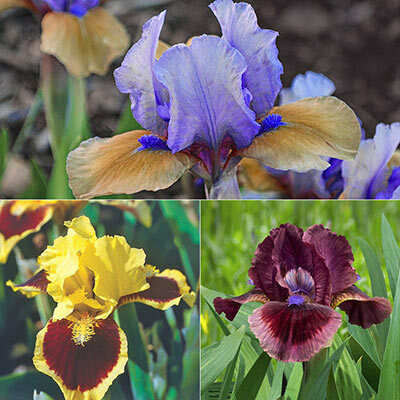 They don't lose any of the impact of the standard size German iris flower form—they're equally as lovely, just in a miniature size. This is a useful quality, not just in front of other taller plants, but also if you have limited space in your garden. These three varieties produce intricate flower forms and striking color combinations for all the drama and excitement without taking up so much real estate. Their low-growing, grey-green foliage is beautiful as well, and has great substance that'll allow it to stay upright and attractive for most of the season—well after the blooms have faded. 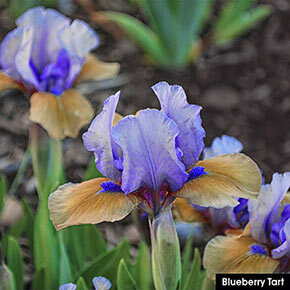 The Small But Might Iris Collection includes: Blueberry Tart, Cat's Eye and Ultimate. Flowering Date: Early-midseason, all rebloom. Winter Care: None, except to mulch in colder climates the first winter. 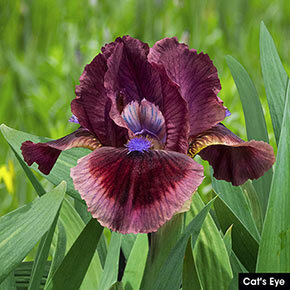 Flower Form: Typical iris-like in various shades of black. Foliage Type: Glaucous-green, sword-like fans of stiff upright leaves. Pruning: Remove spent flower stems after flowering. Cut back foliage to 6" leaf fans in late fall. Late fall/early winter.